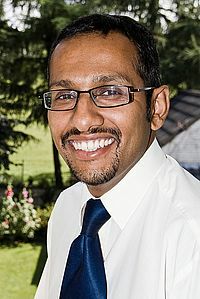 Aylvin A. Dias Ph.D, M.Sc is the Principal Scientist at DSM, Geleen, The Netherlands, currently manages research in drug delivery for ophthalmic and cardiovascular applications and and tissue engineering research for bone and cartilage applications. He obtained his B.Sc, M.Sc and Ph.D in Biological, Organic and Polymer Chemistry respectively at the University of Kent at Canterbury. In 1994 after his Ph.D he worked at Total Chemie on materials for food packaging. In 1996 he joined DSM in the Netherlands. In the first 5 years he worked on optical fibre and stereolithographic materials. In the subsequent 4 years he established the biomedical research program and thereby was one of the founding fathers of DSM Biomedical. The research program lead to the launch of 2 new medical coatings a lubricious coating and an antimicrobial coating that fall under the Comfort Coat TM first generation products. He then went on to lead the drug delivery effort of DSM Biomedical as R&D Manager for two years. More recently he has been the lead scientist in the development of two new degradable polymers that are currently being explored for drug delivery and regenerative medicine. Aylvin Dias has over 30 patents and 20 peer reviewed publications and a member of the Society for Biomaterials. Monitoring the in Vitro Enzyme-Mediated Degradation of Degradable Poly(ester amide) for Controlled Drug Delivery by LC-ToF-MS.
Ghaffar, A.; Draaisma, G. J. J.; Mihov, G.; Dias, A. A.; Schoenmakers, P. J.; van der Wal, Sj. Sun, Huanli; Meng, Fenghua; Dias, Aylvin A.; Hendriks, Marc; Feijen, Jan; Zhong, Zhiyuan. α-Amino Acid Containing Degradable Polymers as Functional Biomaterials: Rational Design, Synthetic Pathway, and Biomedical Applications. Ghaffar, A.; Verschuren, P. G.; Geenevasen, J. A. J.; Handels, T.; Berard, J.; Plum, B.; Dias, A. A.; Schoenmakers, P. J.; van der Wal, Sj. Fast in vitro hydrolytic degradation of polyester urethane acrylate biomaterials: Structure elucidation, separation and quantification of degradation products. Journal of Chromatography, A (2011), 1218(3), 449-458. K. Tomic, W. Veeman, M. Boerakker, V. Litvinov, A.A. Dias. Lateral and rotational mobility of some drug molecules in a poly(ethylene glycol) diacrylate hydrogel and the effect of drug cylclodextrin complexation. J. Pharm. Sci., 97(8):3245-56 (2008). Bolderman, Robert W.; Bruin, Peter; Hermans, J. J. Rob; Boerakker, Mark J.; Dias, Aylvin A.; van der Veen, Frederik H.; Maessen, Jos G.
Atrium-targeted drug delivery through an amiodarone-eluting bilayered patch. Journal of Thoracic and Cardiovascular Surgery (2010), 140(4), 904-910. Stevens, Kris N. J.; Crespo-Biel, Olga; van den Bosch, Edith E. M.; Dias, Aylvin A.; Knetsch, Menno L. W.; Aldenhoff, Yvette B. J.; van der Veen, Frederik H.; Maessen, Jos G.; Stobberingh, Ellen E.; Koole, Leo H.
The relationship between the antimicrobial effect of catheter coatings containing silver nanoparticles and the coagulation of contacting blood. Litvinov, V. M.; Plum, B.; Boerakker, M.; Dias, A. A..
Degradation mechanisms of biodegradable poly(DL-lactide-co-glycolide)1000 diacrylate network as studied by proton solid-state flow NMR relaxometry. Pijls, Rachel T.; Cruysberg, Lars P. J.; Nuijts, Rudy M. M. A.; Dias, Aylvin A.; Koole, Leo H.
Capacity and tolerance of a new device for ocular drug delivery. International Journal of Pharmaceutics (2007), 341(1-2), 152-161. Jansen, Johan F. G. A.; Dias, Aylvin A.; Dorschu, Marko; Coussens, Betty. Fast Monomers: Factors Affecting the Inherent Reactivity of Acrylate Monomers in Photoinitiated Acrylate Polymerization.